Madame Marie Tussaud was an unlikely entrepreneur, but she turned out to be an unusual one - she gave a new meaning to the fashionable art of wax-modelling. Gabrielle Chanel, one of the most successful business people of the 20th century, redefined fashion and reinvented classic. It's fashionable to be creative and beauty makes perfect business sense. Statistics have it that women encompass one-third of the entrepreneurs worldwide. From the art of bridal make-up to fine-dining etiquette to styling and accessorizing; speech and diction, colour and body analysis, she claims to take care of it all. Ditto for Tanvi, who being a woman and having started young, had double the share of problems. “I've handled doubts from my family and team members, who were senior to me; this despite the fact that I'm not in a male-dominated industry.” Nevertheless, there's a difference. “I might even refund the money when I know the client is not satisfied, which a man will probably never do. I'll wait patiently for 45 minutes for a bride and completely understand her, which any man might not.” A lot of business is either intuitive or creative. No wonder, women actually do well on Wall Street! It was only a matter of facing the right kind of music for Khalil Alashar to turn his determination into destiny. The sound of the ghungroos, the beats of a table, the grace of movement and he knew what he wanted to be. “It was the sound of ghungroos that did the magic on me. Also the fact that there is such synchronisation between the ghungroos and the table; it is so spiritual and beautiful.” The twenty-one-year-old from Bahrain, while studying in the US, might have been introduced only five years back to Indian classical dance, but it's better late than never! Back home, there were parallel and alternate plans. “In the Arab society, dance is considered something cheesy and not something to be proud of; certainly not something to be taken up as a profession,” shares Khalil, currently pursuing Bachelor's from California State University. 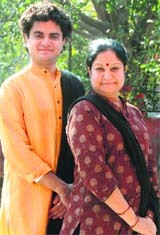 He is in Chandigarh on an invitation by the Pracheen Kala Kendra, along with his tutor Prachi Dixit. It wasn't a very different story for her either. “I did a degree in English Literature, followed by a Bachelor's in Education. Everybody thought I'd be a professor.” She adds, “Once I got through high school, I was discouraged a lot by my family. They had apprehensions about a girl pursuing dance as a profession.” The passion lived on, the rest is history and it's been 29 years of staying in The States and doing what she does best as well as loves the most. “Even if one out of all my students decides to take up classical dance as a profession and teach it, the tradition will live on to the next generation and I will consider my job done,” shares this faculty of Nupur Academy, Torrance, Los Angeles. Adds Prachi, “In America, classical dance and dancers are given a lot of respect. The audience and the shows are packed.” Hopefully, we follow the West this time too. The backlog of cases, the legal hierarchy, the infrastructure, the chambers, the bar bench relations; the differences are stark and but nevertheless, his comparison comprehensive. The book Indo-European Legal System: A Comparative Study stays true to its indication and draws the contrast between Indian and European legal system. 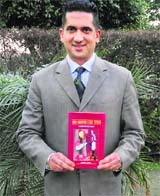 “The book touches upon four different countries in Europe namely Switzerland, France, UK and Belgium,” shares the Ludhiana-based author-advocate Harpreet Sandhu. Behind the scenes, it took three-and-a-half years of research and two visits to each of the four countries. Some of the differences, unfortunately, stand out stark and sorry. He rues, “Outside every court, there's a cause list. While in India, it runs into hundreds of cases. Over there, surprisingly, I have never seen a cause list longer than three to four cases.” It doesn't end there. The observations bring us back to the starting point of the vicious circle. He shares, “To revamp our legal system, the first and foremost thing that we need to do is to shorten the length of the cases.” He adds, “Why should Lok Adalats be there? As far as possible, every case should be put on the fast track. That should be the norm.” Till that happens, meanwhile we can begin by introducing the masses to law and order. “They are so well conversant with their laws, that it is amazing,” he signs off. On Sunday, Amitabh along with his able team brought two stories by Saadat Hasan Manto to Chandigarh. Kahaani Ka Rangmanch, initiated by Devendra Raj Ankur presents stories on stage. They brought one popular story ‘Khol Do’ another not so known ‘Mozel’ on stage. Having regularly worked with Rajit Kapur and Devendra Raj Ankur, Amitabh finds the only similarity between the two is that both are very relaxed. “One would never find any of them tense.” But here the similarity ends. Their mediums are very different, he points out, “While Rajit prefers very well made plays, for Devendra Ankur any literary text would do.” The lack of plays will continue to drive dramatists towards literary texts, believes Amitabh who is happy to be carried on with the flow. The cast finds Manto equally fascinating and testing to portray. 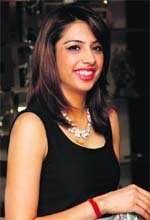 Tina Bhatia who plays an audacious Mozel found it doubly challenging. “To bring on stage a female who smoked back then 1940s is indeed difficult, more so because I am all but her opposite in real life,” she shares. “The genius in Devendra Ankur’s plays lies in actors carrying on the act totally. He ensures that the actors do not get lost in the huge set design or props,” says Prakash Jha who is working with the noted playwright for decade long. Well, doing justice to Manto to his master craft is what this group aims to do and has been quite successful at that! Like her mentor Suneet Varma, fashion designer Jyoti Sharma puts more emphasis on cuts and shapes than on embroidery and embellishments. Her last outing at the WIFW affirmed the same. Titled Nrpsuta-The King’s Daughter was all about how a modern princess would dress up today. The clean cuts, standing collars and puff- shoulders were the highpoint of her collection. She talks about the trends of the season. What’s in: Now is the time to experiment with bottoms. Try a beautifully embroidered, well-fitted jacket with harems, palazzos, straight trousers or dhoti pants. It will provide the much-needed relief from the usual denims that have come to our rescue in the winter. For the coming summer, tone down the embroideries and embellishments. Instead go for interesting colour contrast. Prefer sheer fabric over thick ones. What’s out: Anything over the top! Traditional embroideries make for beautiful work on any fabric but don’t go overboard with it. If your focus isn’t on drapes and layering, you aren’t really conscious of what fashion means this season. Colour count: Go for a mix of colours. Primary colours will always be in fashion but try out rust, orange, vermillion red and peacock blue. These colours make any outfit look graceful, be it ethnic or western. Party couture: A gown or a saree or a little black dress might be a safe bet for a formal event but why not try out something that you haven’t put on for a party before. Wear a full sleeves, short length, embellished jacket with a short kurti and harem pants in chanderi fabric. Dressed to the nines: Style comes naturally to some. They don’t have to make a lot of efforts to get it right and Shilpa Shetty leads on this count. She has never gone wrong with her looks, make-up or outfits. Even now, when she is not seen on the silver screen, she is the best dressed celebrity at parties, award functions and social events. Leading from the front: The front runner of fashion designing in India is Suneet Varma. He wonderfully manages to strike a balance between Indian wear and silhouettes of the West. On Indian fashion industry: We are progressing season by season. The quantum of buyers increase, the sale figures go up, more designers get on board and the market is ever-expanding. The Indian fashion industry is growing by leaps and bounds, we just have to ensure that we are organised enough to manage the boom in the market. We are still in the midst of settling into the New Year, some of us are feeling settled into it and yet some of us are still in a frenzy over it. But whatever be the case with you, whether you are an enthusiastic resolution setter, a casual planner or someone who is indifferent to resolutions, I strongly recommend that you must dream and plan. You must allow yourself to envision the changes that you might love to see in yourself and in things around you. This is a great way of ensuring that we don’t forget to do what we really want to do in life, even if they are only fun things. I feel that having fun is what we need to take very seriously in life if we want to keep our lives happy and stress free. New Year’s bucket lists are useful as they form a firm deadline for action. We just have to get started by jotting down our dreams, create a bucket list of our own and make changes. Vision boards are a way of providing visual motivation that pulls you towards your goals and the things you want in life. A lot of people feel it is these vision boards that keep them reminding of their goals which then keep coming together effortlessly. This is a fun way to dream and plan and just allow life to flow in the correct direction. It is very important that all through the month, we carry the feel of the New Year settling in, so that we can always have space for new ideas. You don’t need to make changes right away in your life. If you don’t feel quite ready just take a week or ten days settling down. Solidify your plans and your resolve. To keep stress at bay, remember celebrations are very important. Being together with people who are all celebrating creates a fantastic synergy and a level of joy much required in the human existence. Research has proved that it’s easier to reach goals if you have the support of a group. If at the beginning of the year, we announce our goals to our group of friends and start trying to work towards them together, there is always a sense of friendly challenge that keeps us going. Helping people find joy and happiness in life and leading a stress free existence is a great motivating force for a lot of us. Try and find people around you whose qualities you admire and you’d like to develop. Ask them for their tips for success. “You always seem calm, how do you relieve your stress,” could be your question. Start a stress relief habit with a friend and check once a week with each other how well you are working towards it. Think in terms of what you can add to your life. Give yourself more room for growth than change. Experiment and change the course of the habit which you are following. Learn to face the challenge of the New Year boldly with enthusiasm, joy, excitement and peace. Just move forward into a joyful and stress free zone. Saif Ali Khan is married now and has quite a few movies coming up. He is still holidaying in Gstaad, Switzerland and this is his honeymoon holiday with Kareena Kapoor. He talks about being married and more. It is very cold here but at the same time very beautiful! It is very different this time as we are completely into healthy eating and healthy drinking with very little partying. We hope by the time we are back we are fitter than before (laughs). It is a completely different ball game. There is a lot of difference between a boyfriend and a husband. Expectations change and so do your reactions. If I start talking about the exciting and not-so-exciting things, you will need a few more pages. Please ask Tigmanshu about this… I love him to the core. I hate to question my directors. If I start doing that then I will be in a huge mess. I'm an actor, not a director. My directors have more sense of cinema than me. When earlier I had suggested that there should be a sequel to Main Khiladi Tu Anari people laughed at me. Look at the West, they are making so many sequels. Imagine a sequel to Sholay would have been so cool! Ranveer was the easiest role of my career. It was for the first time I played the role of a mature man. And so as far as acting was concerned, I was on a holiday. 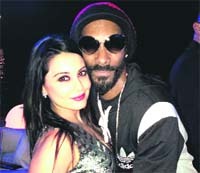 Minissha Lamba was floored by Snoop Dogg at one of his concerts in India. She is a fan of his and he even sung her favourite song for her. She was surprised by how humble he is despite being a star. Anushka Sharma invited her latest female co-star and rival Katrina Kaif to a special screening of Matru Ki Bijlee Ka Mandola and the two got along like a house on fire. She really does not like all the stories about the rivalry that are circulated and wanted to clear the air for good. Urmila Matondkar is an accomplished dancer and can dance to any song. These days, she is a mentor on a dance reality show and she loves dancing to any number. It comes naturally to her. She feels Hrithik Roshan is a treat to watch when it comes to dancing. Aamir Khan will direct a movie again after he wraps up Dhoom 3 and Raju Hirani's PeeKay by late 2013. He wants thirty scripts on his table to choose from and he will pick the one that will do justice to his directorial skills. It will be a dream come true for the script-writer. This time he wants complete control and will ensure that there is no controversy like during the time of Taare Zameen Par. Mughda Godse is doing an item number, instead of Neha Dhupia, in the sequel to Saheb Biwi Aur Gangster 2. The song will be shot in Delhi. Neha opted out due to date issues and delay in filming. Karan Johar has chosen Varun Dhawan again to star in a film directed by Ruchi Narain. This is her directorial comeback and quite different from the movies she has worked on before. An official announcement will be made soon and Varun is also doing Ekta Kapoor's picture directed by his father David. She loves dancing on energetic numbers and actress Sonakshi Sinha, who proved her skills with the song Govinda in Oh My God!, is looking forward to her item number in Sajid Khan's Himmatwala which she starts shooting soon. “I am going to do an item number for Sajid Khan's Himmatwala. “Mine is a very different song. It is a 1980s disco number and I am really looking forward to it,” she said. Producer Krishka Lulla invited Anil Kapoor to the re-launch of a hotspot. He told her that she should send him the guest list and then he would decide if he wanted to attend or not. That is very Hollywood behaviour. Actress Anne Hathaway became so fragile after losing 25 pounds for her character Fantine in Les Miserables that she broke her arm in a fall. According to the 30-year-old actress' co-star, ten-year-old Isabelle Allen, who plays her daughter Cosette, Hathaway lived on “rabbit food” during the shoot and she was so thin during the filming of the movie that she broke her arm while she was riding a bike, reported a publication online. The young British actress had lunch with Hathaway in New York after the film's premiere last year and she was apparently craving the chips that Isabelle was eating. Actor-filmmaker Ben Affleck was honoured for his humanitarian efforts in the war-torn Democratic Republic of Congo at a ceremony in California. The 40-year-old star has received plenty of acclaim during the ongoing Hollywood awards season for his thriller Argo, but it was his work with his Eastern Congo Initiative that was recognised by the Cinema for Peace Foundation at the Gala for Humanity in Beverly Hills, reported a publication. 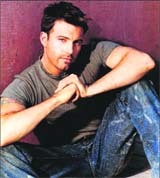 Affleck picked up the Humanitarian Award and was hailed for demonstrating the “foresight, courage and leadership” needed to “take a stand against extreme injustice, intolerance and inequalities”. The Eastern Congo Initiative is the first US-based advocacy and grant-making initiative wholly focused on working for the people of Eastern Congo. Harry Potter star Daniel Radcliffe reportedly earned a profit of 17 million pounds from his work last year. The company that manages his assets, including all Potter-related earnings, is now worth 48 million pounds -- up from 31.2 million pounds in 2011, reports a website. “He's very savvy with money and is worth far more than many successful actors twice his age. Hollywood has been a big earner for him. But Daniel's gone further and sunk that capital into shares and property. He's been the same way throughout his career,” a source said. Samiksha Bhatnagar is quite happy with the way her character is shaping up in the Star Plus show Veera. “I play a sweet, homely, dedicated housewife, Gurmeet who is Kartar’s (Sampooran Singh) best friend’s wife,” she informs. Coming to the current track of the show, she says, “Gurmeet had to get her uterus removed. Enacting the scene was very emotional as every woman dreams of becoming a mother one day. While performing the scene, I came to realize the kind of agony such women go through and how society treats them.” Besides Veera, this actress from Dehradun is also essaying the role of one of the fairies (Vijdhar pari) in SAB TV’s fantasy show Baal Veer. “She has a lot of and is very strong,” she quips. Prior to this, she has also done a cameo in Kyaa Huaa Tera Vaada and also played a negative avatar in Sahara One’s Niyati. Although for the moment, Samiksha is only focusing on TV, she is not averse to returning to the big screen if a meaty offer comes along. She also has no qualms about the fact that she is not playing lead role on the small screen. “I think character roles are equally important and I have been noticed in all my projects, be it in Veera or as Mona Singh’s younger sister in Kyaa Hua Tera Vaada,” she ends. Vaishnavi Dhanraj who was seen in Na Aana Is Des Laado, got married to actor-model Nitin Sahrawat on December 23 in Haridwar. Vaishnavi whose work was appreciated in Laado... is on a break and plans to take up acting soon. Narayani Shastri has been missing since a while in Phir Subah Hogi but will soon return to the show. And when she does, sources claim that the story of the show will revolve around a track to create awareness about women’s rights. The show that was shifted to 11pm isn’t garnering decent TRPs and hopefully this track will boost the ratings. Vishal Singh aka Jeet of Parvarrish is enjoying his break these days. He has gone on a holiday with friends. Shooting the show continuously leaves him with little free time, so when he got the time, he made ample use of it. He hopes to get more such breaks in the future as these helps them return to work with more energy. Kushal Tandon aka Viraat from Star Plus' Ek Hazaaron Mein Meri Behna Hai is working hard to prove his dancing abilities in Nach Baliye 5. While his girlfriend Elena has been getting good remarks in the last episode, the judges weren’t too happy with him. But as his shooting schedules keep him busy, he has decided to practice his steps in between the shots. His choreographer and Elena rehearse with him when they can. That’s a great idea! The Sun has entered the Zodiac of Capricorn today. This is called Makar Sankranti, a day of Sun which is benefitting the human body. Worship The Sun and donate things to poor. If possible have a dip in the Holy Ganga during Kumbh Mela at Allahabad. In this particular year of life, try not to waste energy. You'll be able to count on a close friend. You'll both be on the same wave-length and you'll have a moment of immense joy. You'll be very receptive and will use every opportunity to improve your finances and ego. Your loved one will stop you from postponing a decision which concerns your future. However, don't worry because eventually he or she will understand your reasons. You'll be able to enjoy this phase by slowing down and simplifying your life. It'll be easy to conquer others and you'll be able to start up a new relationship if you are single. If you learn to adapt to the situation in hand, you will obtain great well-being and assured success. January will be average. Worries may bother your mind regarding money matters. Be calm and take guidance from learned people to find a way out. In February, you will be prepared to take up challenges. Hard work and dedication will fetch you good gains at work. It will be a good time to travel. You will be looking for ways to develop positive energy within you. Fewer worries will enable you to enjoy March. Travel will make you happy. April will be active for you. Your past efforts will pave the way for success now. Pleasure and luxurious moments will make you feel refreshed. Travel is on the cards. Spending time with your family and relatives will give you a welcome break from your busy schedule. You will be able to find the ways to minimize the gap between income and expenditure. July suggests that you should use a brief break to assess and make adjustments to your priorities or relationship. Towards the end of 2013, you'll adopt new methods but someone won't appreciate them and will criticize. Hyacienth Diva Mantalaba, better known as Diva Montelaba (January 14, 1991 in Cebu City, Philippines), is an actress. She was one of the finalists in the fifth season of StarStruck, a reality-based talent show of GMA Network in the Philippines and finished as first runner-up.